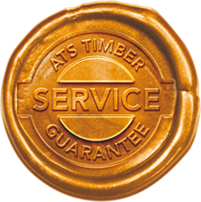 To cement our position in the market as a top service provider of specialty timber products, ATS Timber has launched a special Service Guarantee for our Approved Resellers. This is a really simple, clear promise to our customers that we will stand by our word. There is no terms and conditions and fine print. It just states that “If your order doesn’t arrive on the day we say it will or before, we’ll give you, at your request a $50 food or fuel voucher.” See other reasons Why to choose ATS Timber on your next special timber requirement.